VFF Vintage Flight Foundation - De website van vintageflightfoundation! Vintage Flight Foundation or VFF was founded in 2014 with the goal to preserve former military aircraft. 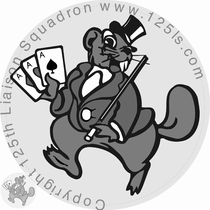 The VFF has a dedicated unit specialising in WW2 liaison aircraft "The 125th Liaison Squadron" and is named after the original squadron attached to the 9th U.S. Air Force during World War 2 in the European Theater of Operations (ETO). Our foundation and dedicated squadron will initially consist of two liaison warbirds. 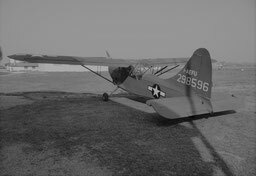 Our first addition is a 1944 USAAF WW2 Piper Cub L-4J Grasshopper. 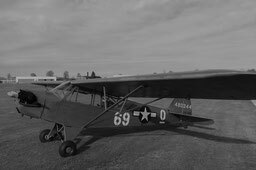 Our second addition is a 1942 USAAF Stinson L-5 Sentinel. Both aircraft were used as Artillery Spotter / Liaison aircraft during World War 2. It is our goal to present these aircraft to the general public in order to highlight the importance of these rather unpopular aircraft that were actually on top and in the middle of the action at the front. Additionally we do research, gather aviation pictures, documents, aviation artefacts and share valuable historical information on liaison aircraft. Last but not least we ferry Piper and Stinson aircraft across Europe and have experience with transporting dismantled aircraft across the world. So if you need assistance, we can help you with our expertise. Our Piper L-4 and Stinson L-5 are available for Foto shoots on the Ground or in the Air. Either in Static or in Action they make a nice back Ground for your World War 2 Pictures or movie production. We support WW2 reenacting, living history events and commerative celebrations either on the Ground or in the air. For your complete World War 2 set up we can provide the right contacts. Please contact us for further information. There is a lot going on behind the scenes to make everything work. This webpage will be updated as we progress. We will be present with our aircraft at the 2019 "L-Birds back to Normandy" event to remember the D-Day landing 75 years ago. Don´t miss it. More info in our links chapter.